Here are 3 detailed methods of gathering! First, we have the most common method of gathering (used more for lightweight to medium fabrics). 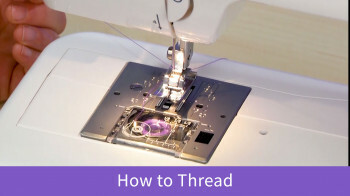 If you have a sewing machine that cuts your thread with a scissors button (or your bobbin thread does not typically need to be pulled up) so that your top thread is the only one above the needle plate, you'll need to first pull your bobbin thread up (and resist the urge to use the scissor button). To raise your bobbin thread, with your presser foot up, hold onto your top thread. Use your handwheel or your needle up/down button to lower your needle and then, press again to raise it (all the while holding your top thread, not too tight to allow the top thread to go around the bobbin case). 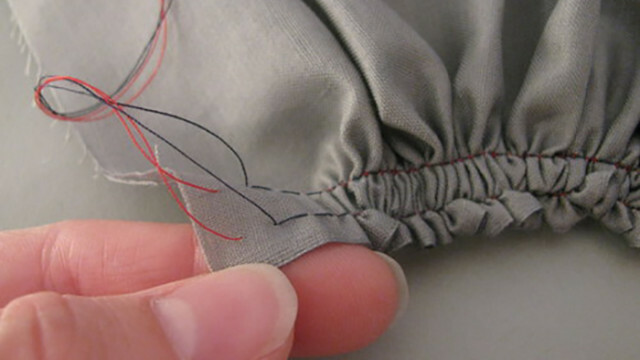 After your sewing machine has made one rotation, gently tug on the top thread. Whether your bobbin thread comes up short or long, pull it up and out as long as your top thread. You need long threads at the beginning and end of your soon-to-be stitch lines to assist in the gathering process. Set your stitch length to 5.0. My standard needle position is to the left, so I moved my needle in a little by changed my "width" (which, in the straight stitch mode only moves the needle over) to 1.0mm so that when I actually stitch my gathered piece to something my basting stitches hide within that 1/2"-5/8" seam allowance (depending on what you are sewing). Disregard the 4.0 tension, that is standard and has not been adjusted for my machine. Now, line your foot up with the edge of the fabric. WITHOUT backstitching, stitch a long basting stitch down your edge with your fabric even with the edge of the foot as your seam guide. Do not backstitch at the beginning or the end. And when you get to the end, lift your needle up to the highest position, lift your foot up, then draw your fabric out and cut the tail of your thread about 6." Now, I changed my needle back to the left and lined my first baste line up with the left side of the foot to stitch a second basting stitch (make sure your stitch length is still at 5.0mm). Stitch your second baste line; don't forget to start and end with a long tail of threads and don't backstitch. Also, make sure that your stitch lines do not cross each other. Here are my 2 basting stitch lines with 4 long tails at the ends of both stitch lines. I like to tie all 4 threads together at one end only (and only if I'm gathering a shorter piece of fabric; if I'm gathering an entire adult skirt waist or something, I leave both ends open so that I can gather from both ends) so that I don't end up just pulling my stitches right out as I am gathering. You will, then, flip your fabric over so that you are working with the bobbin thread (it, without a doubt, gathers more easily than the top thread) pull your fabric over the bobbin thread (hang on to the 2 bobbin thread strands as you pull the fabric in the opposite direction). It should start scrunching. Whatever you do, do not pull the bobbin threads and then pull the top threads, you'll lock it up (and sometimes that means taking your stitches out and starting over). Pull your fabric to your desired gathered fullness. You can pull your bobbin thread to pull the top thread up in loops. Pull those loops completely up and out so that all 4 threads are on the same side of fabric. Now, knot all 4 threads together (picture below P.S. statement). Done! Gathered! Accomplishment! This second method works very well with heavier fabrics! The above picture represents my eventual seam allowance (the red line) as if I were sewing this gathered piece to something (sewing a gathered piece to a flat fabric piece is shown in this Diaper Bag Tutorial), you can stitch this line in a thread that exactly matches your fabric if you like, but, it's not necessary (I just thought it would be a great visual aid in this tip). I zig-zag stitched over a 1/8" ribbon onto a stiff canvas and it worked really well (you can use something like a jeans thread, as well). I used a braiding foot (and BTW it was AWESOME) to aid in keeping my ribbon in the middle so that I didn't accidentally sew onto the ribbon defeating the purpose because the ribbon needs to move freely underneath our stitch (but, you can use a regular foot, just make sure as you are zig-zagging, do not stitch onto your ribbon/thread). The next 3 images show the braiding foot and how the ribbon is inserted; you can see that the ribbon is threaded through the foot opening, underneath the foot and about 2" behind the foot. If you are using a regular machine foot, just place the ribbon or heavy thread underneath the foot as centered as possible, extending 2" behind the foot. I lined my seam allowance red line up with the inside of the foot. Regardless, wherever you zig-zag, you want your zig-zags to be within a 1/2" of the fabric edge so that your zig-zags do not show when sewn to another fabric piece. Set your zig-zag stitch to the highest stitch width (7.0mm on my Baby Lock Quilter's Choice, which is now the Baby Lock Melody) and I left my stitch length at 1.4 (standard machine setting), but you can set it higher if you want chunkier gathers. 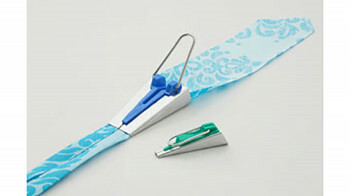 Now zig-zag over your ribbon, backstitching at both ends (so that when you gather, your end stitches don't pull out). Notice that my zig-zags do not cross my eventual seam allowance line, but are very close to it. After zig-zagging, I straight stitch reinforce over one end of the ribbon if I'm gathering a short piece (if I'm gathering a really long piece of fabric, I'd leave both ends open to allow for gathering on both sides). Then, on the end where the ribbon has not been reinforce stitched down, you'll slide the fabric over the ribbon. It works beautifully! Pull to desired fullness or length. I then, like to reinforce stitch the open ribbon end so that my gathers don't move (if I'm gathering a really long piece of fabric I don't worry about backstitching over either end of the ribbon because I may need to adjust my gathers, for instance, if I'm sewing a gathered skirt to a fitted bodice). And, the final method is gathering by serger, used for lightweight to medium weight fabric (you can actually gather heavy fabric with a jeans thread similar to the above method with a serger using an elastic foot, too, but, that is not illustrated in this tutorial). I used my Baby Lock Evolution Serger to gather; you can do this method with the other Baby Lock Sergers, too! 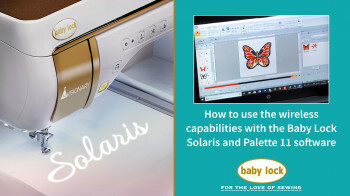 This method would make this Table Runner Tutorial a lot quicker! The above photo shows that I have set my differencial feed to the highest it will go to 2.0. 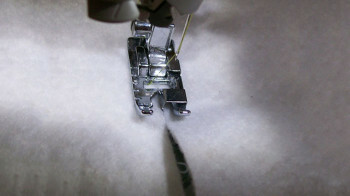 Then, set your stitch length to the highest it will go to 4 (on the Baby Lock Sergers). The stitch width should be normal (M-7.5 on Baby Lock Sergers; mine was set at M or 3.5) and your needle tension, if you have it, should be at 5 (standard setting). Your blade is not locked down. Place your fabric at the front of the foot, press your foot pedal so that it will pull your fabric underneath and you're on your way! Don't pull the fabric feeding behind the foot; if anything, you can try placing your finger near the back of the foot on the fabric that is feeding out (releasing from time to time to allow for fabric movement) to encourage more gathers. As you can see below, the fabric has already begun gathering. If you look at your cut serger thread tail, the 2 threads that are shorter should be your needle threads (you might stitch with 2 needle threads that are a different color to be able to tell better). My thread tail is shown below, one shorter thread is red and one is white. You can pull the 2 shortest threads and gather more fullness into your fabric! I was able to get a lot more fullness into my fabric! Hope this was helpful! If you have any questions, extra tips, or something was unclear, kindly leave a comment! Show us your gathered projects and the gathering method that you used by posting a picture to our Totally Stitchin' Facebook Page!!!!!! We love to see what you're creating!